Protect your company's email traffic against all types of malware and spam. Cloud-based corporate email security and filtering. Poor email security protection can lead to latency, email server downtime, network unavailability, productivity loss and disruption of business activities. Mass email marketing campaigns may compromise a company's reputation. Panda Email Protection is a service that provides multi-layer protection for your company's email. In addition, thanks to its advanced cloud-based scanning technologies it does not require any additional infrastructure to start operating. Email Protection requires no client infrastructure. All operations are performed in the cloud. Email Protection offers immediate, effective protection against viruses and spam, through online scans performed on Panda Security's servers. Automatic: Adapts to the user, maximizing efficiency and preventing false positives. Guaranteed: Guarantees that 100% of spam is blocked, as it checks if the sender appears on a whitelist. RBL: Blacklists that log the IP addresses around the world that generate spam. SPF: Protection against address spoofing when sending emails. Global blacklists/whitlelist, by domain and local (by user). Email Protection allows centralized installation and management of the security of your company's email service from a Web console. It does not require installation, and platform updates are performed automatically and transparently. Email Protection is a cloud-based service that does not require investment in infrastructure or specialized staff to manage it. It reduces bandwidth consumption in your company by filtering spam before it reaches your company's network. Plus, your users will spend less time checking junk mail. Email Protection allows secure and constant access to your company's email using the Webmail service. This service guarantees email delivery during temporary crashes of the mail server and includes a backup service. Get a dynamic view of system status and filtering activity. Check the dashboard and reports accessible from the Web console and find out the status of your mail service. Email Protection lets administrators configure security profiles by user, company, or domain. Its Web console can be accessed anywhere, anytime. Its central quarantine allows administrators to take mass actions on messages from the log list. Additionally, administrators can establish email usage policies for the whole organization. Finally, the solution has a sophisticated rules engine that allows automatic management of spam. Manage email security by company, domain or user. Manage the centralized quarantine in order to perform mass actions or apply usage policies to the company's email. Use the rules engine to set criteria for automatic processing of spam. The integration of Cyren's technology, including antispam, pattern-based virus detection and reputation lists, provides maximum protection. Proactive anti-malware, anti-phishing, anti-spyware and anti-spam protection, based on Collective Intelligence. Email Protection includes Cyren technology, with anti-spam, pattern-based virus recognition and reputation lists. Anti-spam protection with 99.9% effectiveness ratio. Email Protection provides continuous email access and use via its single, Web-based administration console. Additionally, its webmail service allows users to compose, receive and send messages at all times. In the event of email server failure, Email Protection will continue to receive and store inbound mail for up to four days in order to deliver it when the server is recovered. During this time, users can access their email via webmail or the dashboard. Email Protection email backup feature stores messages for up to 15 days at no additional cost. 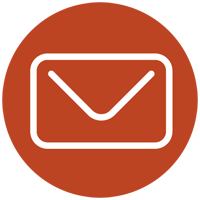 The Webmail service will always be available to write, receive and send email at all times. If the mail server crashes, Email Protection will continue receiving external email and store it in order to deliver it when the service is restored. Email Protection backs up your company's email. Access this backup copy for 2 weeks, at no extra cost. The Email Protection dashboard provides administrators with a dynamic view of system status and filtering activity for various timeframes. It offers reports for users and administrators, and sends filtering information to company and domain administrators. 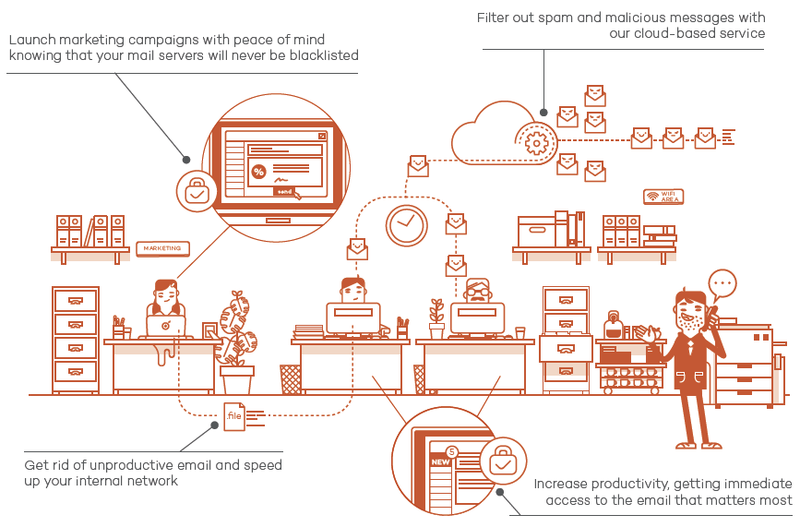 Email Protection harnesses the power of Collective Intelligence to deliver real-time proactive protection from the cloud, ensuring the highest levels of detection for known and unknown malware and threats in inbound and outbound email traffic. Available as a cloud-based service, it requires no infrastructure investment or specialized staff. It uses specific technologies to reduce resource and bandwidth usage with no upfront investment. Security can be managed anytime, anywhere from the Web console. Installation is effortless and updates are automatic and transparent to users. It gives users secure, uninterrupted access to email via webmail regardless of their device and location. It ensures email delivery in the event of mail server problems, and offers email backup. The dashboard provides administrators with a dynamic view of system status and filtering activity for various timeframes. Its automated reports show detailed summaries of network activity and allow administrators to filter information on demand. For more than 1000 users, please use our Quote Request to request your pricing.